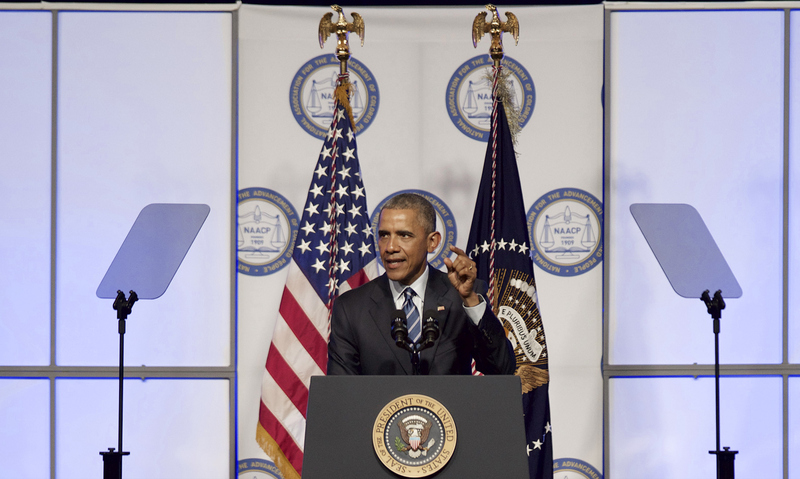 President Barack Obama gave a speech at the annual convention of the NAACP in Philadelphia on Tuesday, and he addressed the horrifying fact that the majority of people in U.S. prisons today are poor minorities who often did not commit violent crimes. Rather, most of these people fell victim to mandatory minimum sentencing laws during the "War on Drugs" in the '80s and '90s, and federal tax dollars are being used to keep them in prison despite the fact that their crime was nonviolent, according to CNN. Obama's best quotes on criminal justice reform make it clear that this issue is about social and economic inequality and a system that disproportionately incarcerates people of color. Obama released some stats from the speech on Twitter that make the size of the problem very clear: the U.S. is home to 5 percent of the world's population, but 25 percent of the world's prisoners; the U.S. keeps more people behind bars than the top 35 European countries combined; in 1980, there were 500,000 people in American jails, and today there are 2.2 million — most of those are nonviolent offenders; the $80 billion we spend to keep people incarcerated could put every 3- and 4-year-old in the U.S. in universal prekindergarten or it could double the salary of every high school teacher in the country. And, worst of all, the system is perpetuating racial inequality and poverty. Obama started his speech in a goofy way with, "I've got some stuff to say," but then he turned serious. He said there are many things within the criminal justice system that need to change if we ever expect former prisoners to leave prison and lead fulfilling lives. If we make investments early in our children, we will reduce the need to incarcerate those kids. One study found that for every dollar we invest in pre-K, we save at least twice that in reduced crime. We recognize that every child deserves opportunity. Not just some. Not just our own. What doesn't make sense is treating entire neighborhoods as danger zones. We've got to make sure boys and girls in those communities are loved and cherished and nurtured and invested in. We have to restore trust between our police and some of the communities where they serve. Don't just tag them as future criminals. Reach out to them as future citizens. We should not tolerate conditions in prison that have no place in any civilized country. Let's reward prisoners with reduced sentences if they complete programs that make them less likely to repeat an offense. Justice is not only the absence of oppression — it is the presence of opportunity. Justice is making sure that every young person knows that they are special and their lives matter. Justice is living up to the common creed that I am my brother's keeper and I am my sister's keeper. Justice and redemption go hand in hand. We are not perfect, but we have the capacity to be more perfect — mile after mile, step after step. We cannot ignore the problems that we have, but we can't stop running the race.